So how do you know how good a turntable really is regardless of cost? First, heavy is good! Next, turn the turntable on and have the platter spin. Then lift the stylus up from the record surface using the lifter and then slowly turn your amplifier up. The better the turntable the less noise you will hear. Any noise that you do hear is coming from the turntable or possibly the preamp or amplifier. To eliminate the amplifier and preamp, disconnect the turntable from the rest of the system, slowly turn up the amplifier and see what noise is left. Any noise that disappeared is due to the turntable. Of course nothing is quite that simple but it is a reasonable test. Another test is to lightly tap the tone arm with a pencil while the turntable is in play mode (with tone arm lifted off the record). You will hear some thump in most cases. The loudness of the thump indicates how much noise the tone arm has itself could be contributing to ambient noise. Tone arms can pick up vibrations too and play a very important role in overall quality in how they track, noise abatement, etc, and can cost $1000 or more for extreme examples! Of course the type of phono cartridge; ceramic, magnetic, etc. is very, very important. The bottom line regarding a turntable, regardless of how simple they may appear, is an instrument, and just like any other fine instrument you can buy something that resembles a turntable (a “TSO” – Turntable Shaped Object) or you can buy a fine instrument. There have been literally thousands of turntables devised over the years with fundamentally different approaches to reproducing records accurately with new prices ranging from $30 to $100,000. They really must be evaluated individually depending on your needs. And in the used turntable market where the price does not necessarily correlate to its quality you can find some real classic bargains. Just don’t make the mistake of thinking that you can buy a new turntable for $100 or so and get an instrument. Get a quality turntable that you will provide you with a device that will last a lifetime, and will allow you to enjoy the true “Classic Vinyl Listening Experience”. You will be very glad that you did. 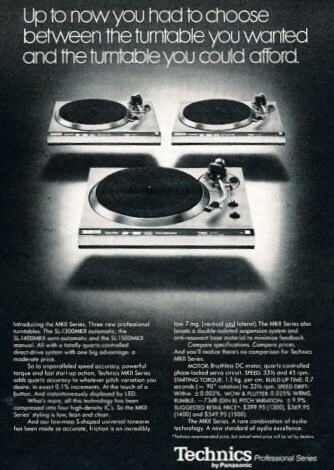 The discussions about turntables and vinyl records, over the last thfree newsletters has been very good. how to clean vinyl records was extrremely helpful I had been looking for a good and simple way to clean my records. your newsletters are great! Keep it up. my question for you is, how do you know if the motor is out,or the motherboard is out. my turntable lights are all still on,but platter does not turn. but so curious is it tht the motor is out.or the motherboard. and and all help Much and Greatly appreciated. too. ld love to send a picture of the way it looks but theres no way to upload on this page.